You’ve probably heard that your body and mind would react to different scents. Some scents can make you relax and helps with anxiety. Indeed, aromatherapy is a growing practice that uses scent to improve your well-being. Scented candles are frequently used in aromatherapy. However, not all scented candles are created equal. In fact, choosing the wrong type of scented candle can be pretty bad for your health. Yet, this doesn’t mean that you should rule out getting any scented candles for your home. Scented candles play an important role in aromatherapy. It’s just that artificially made scented candles that are hazardous to our health. These scented candles contain paraffin, and metal wicks, that are both toxic to your health when they are lighted up, as reported by the Environmental Protection Agency of United States. Paraffin is a petroleum-based ingredient that you’ll find in typical candles. When burnt, paraffin produces toxic chemicals that may lead to cancer. You’ll also want to avoid candles with metal wicks as they also produce harmful chemical when lighted. Besides that, you’ll also want to avoid synthetic fragrance, where the scent could damage your physical health silently. If you’re sensitive to synthetic fragrance, you may suffer headaches from the scent. That’s how bad artificial candles are for your health. Instead, choose only natural scented candles for your home if you want to get the therapeutic effects of aromatherapy. Here are how naturally scented candles can benefit you when you avoided toxic scented candles. Focus – Candles with lavender or lemon scent can help you to focus, especially when you are trying to finish up an assignment as deadlines loom. Release Stress – If you’re overwhelmed with stress, lighting up chamomile scented candles may help you to de-stress, especially after a long day at work. Manage Anxiety – Both lavender and bergamot scented candles have a natural calming effect on your anxious mind. Insomnia – Aromatherapy is also known as an effective healing method when you suffer from insomnia. The pleasant scent of rose or lavender can make your eyelid feel heavy before you know it. Muscle Aches – If you’re feeling sore after an intensive gym workout, lighting up peppermint scented candles can do wonder to your muscles. Peppermint is known as a great muscle relaxer in aromatherapy. Besides your personal well-being, having naturally scented candles in your home also changes the mood of the rooms. You can use different types of scented candles for each of your rooms to provide the desired ambiance. You don’t need fancy equipment to make scented candles. In fact, you can make scented candles right in your home if you have the time to learn how to do it. Here’s the rough process of making naturally scented candles. Melt the beeswax or soy wax. Stir melted wax in the essential oil. Cut the wick and tape on a holder. Pour the wax into a container. Secure the wick with a holder on top of the container. You can get more in-depth detail from this article. But if don’t have the time to go through all the process, read the next part on how to choose the right scented candle. You’ll want to avoid mistakes when choosing scented candles. The last thing you wanted is to turn your home into a toxic polluted chamber. To prevent that, here are what you need to consider when choosing scented candles for your home. Natural Ingredient – As noted at the beginning of the article, it is important for the scented candle to be toxic-free and made of natural ingredient. Choose candles that are made of soy wax or beeswax, and uses natural essential oil. Choice of Scents – Various scents have their own properties in aromatherapy. Lavender is one that’s commonly used for anxiety, and chamomile helps you to sleep. Besides that, different scents create a unique ambiance in different parts of your home. Floral scents are great for bathrooms while spicier ones paint a romantic mood in your bedroom. Your Personal Preference – Sometimes you need to stop listening to other’s opinion and choose the best scent for yourself. Candle Jar – It doesn’t hurt to have an aesthetic candle jar that matches your design. A scented candle can be a great decor as well. Do not fall into the trap of buying ridiculously cheap scented candles. Chances are, they are low quality and contain toxic ingredients. 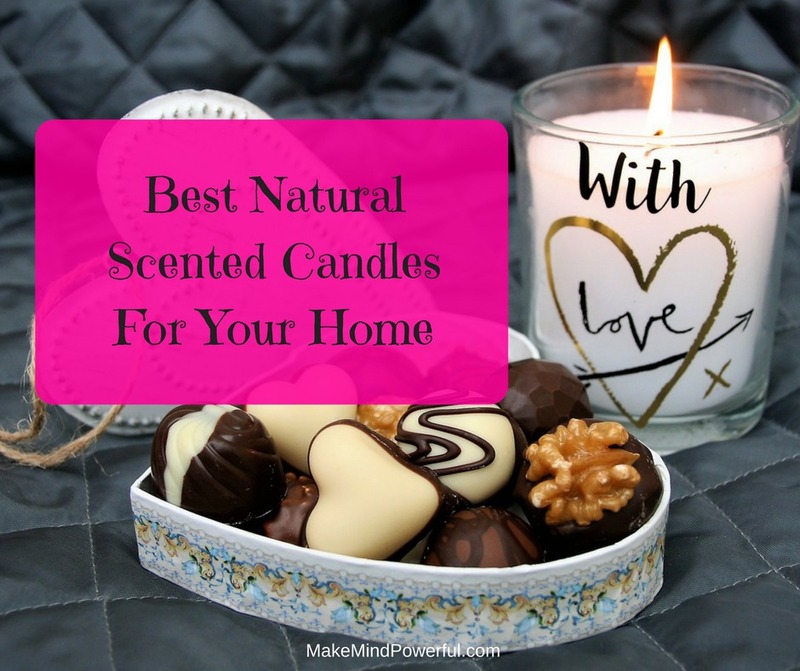 Get naturally scented candles from reputable brands instead. Of course, you can buy scented candles locally but if you prefer to shop online, getting from Amazon will ensure you get the best deals. It also saves you the trouble of searching up every scented candle suppliers as most of the reputable brands are sold on Amazon. Here’s a list of naturally scented candles that I’ve personally picked to save you the trouble. They received favorable feedback from the hundreds of customers who used the candles. Founded in 1994, Chesapeake Bay Candle is known for its nature-inspired scented candles. Since its humble beginning, Chesapeake Bay Candle has gone on to partner with some of the most popular retailers in the US, a testament to the ever-growing demand for their scented candles. This special set of scented candles are made of natural soy wax, and lead-free cotton wick, making it safe to be used in your home. Each of the candles has a burn time of approximately 40 hours. With four types of fragrance in a set, you’ll be able to place one in different areas of your home to create various ambiance. The candles are presented in modern looking jars that come with wooden lids. You’ll also find that the candles are applied with a clean and serene palette of colors that gives them looks great. They would blend easily in any modern homes. Each of the candles will calm your sense as the fragrance filled the spaces of your home. The mixture of essential oils in the scented candle carries great therapeutic properties. Only natural scented candles like these will have a positive effect on your well-being. Made with soy wax and cotton wick. A smooth scent that’s not overpowering. Burns up to 40 hours per candle. Some find the scent too weak. There are no cutting corners for Paddywax when it comes to making scented candles. Featured in popular media, Paddywax is committed to producing environmental friendly candles for their customers. Their range of high-quality candles is great gifts for any major occasions. 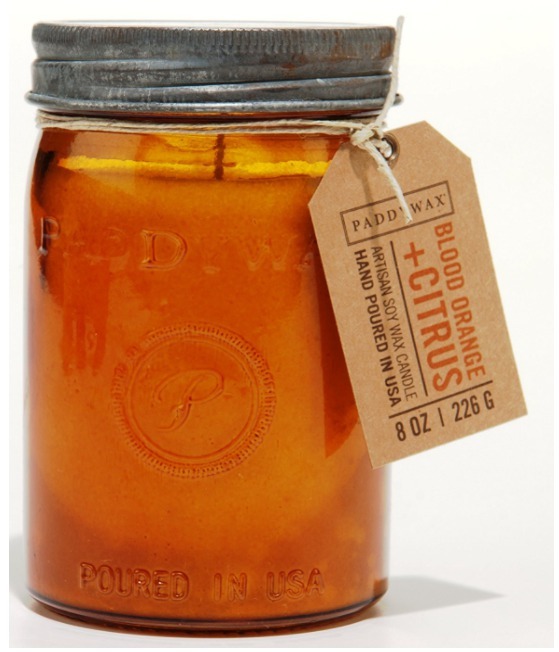 Scented with blood orange and citrus, the candle is made from soy wax that is hand poured into a 9.5-ounce amber jar. Every jar of candles is uniquely personal as they are is hand-treated in the making. This jar of a scented candle is good enough to last you for up to 60 hours. Made with traditional techniques, you’ll get to experience pleasant aroma from the natural ingredients that are blended perfectly. Free from synthetic fragrance, it serves as a great stress reliever in your personal comfort space. Not only does the jar looks great as a home decor, the fact that it is hand poured and packaged made it a meaningful gift for your loved ones. If you’re planning to try a mixture of natural scents, Paddywax offers a vast choice of candles to choose from. The scent may be too weak for a large room. 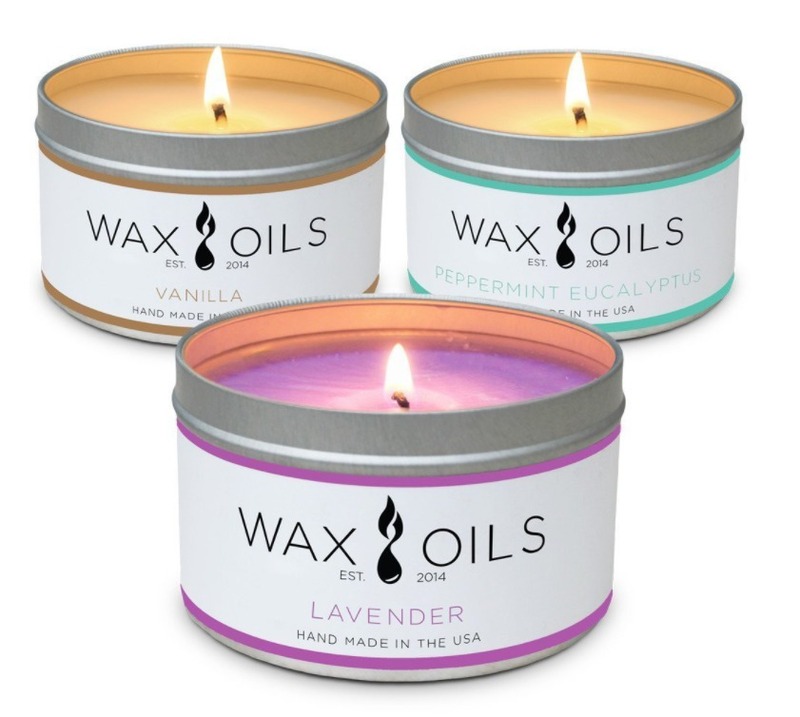 Started in 2015, Wax and Wick realized how harmful paraffin can be in regular candles. The founders vowed to use only natural ingredients in their scented candle. 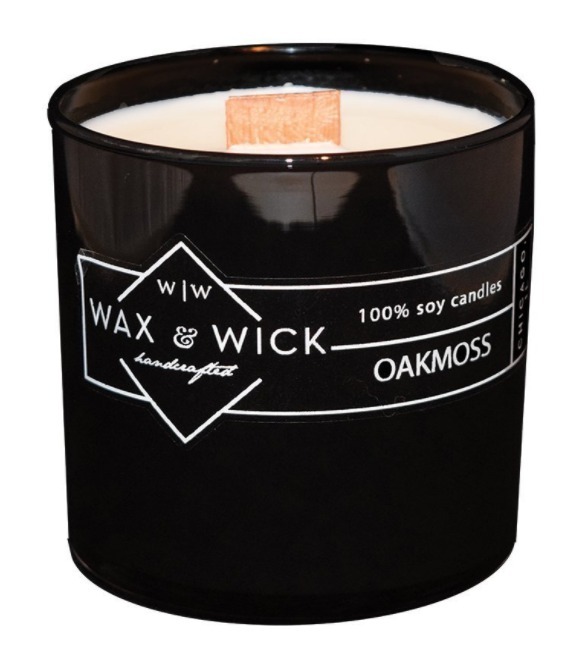 You’ll only find 100% soy wax, premium fragrance oils and wood wicks in their scented candle. This modern jar of a naturally scented candle will produce a fresh woody scent with subtle hints of amber, vanilla, and sandalwood. This natural scent appeals to both genders alike. Made of soy-wax and non-toxic, the candle can last up to 60 hours in your home. What made this candle special is the fact that it has 2 wooden wicks instead of one. Not only do you get a brighter ambiance, one of the wicks give off crackling sounds, that made you think you’re beside a fireplace. There’s nothing fancy with this scented candle. Made in the US, it is minimal in design and fits for most homes. You’ll find the scent calming as it permeates to all corners of your room. You’ll sens its presence literally even before it’s lit. The wood wicks may need trimming before being lit. Aroma Naturals is a family owned business that has been growing strong after 20 years. Founded in a humble kitchen, an attempt at creating aromatherapy candle has led to a growth of naturally scented candle venture. Only natural ingredients such as pure essential oils are used in producing Aroma Naturals scented candles. If you’re into aromatherapy, this scented candle infused with pure essential oils is perfect for you. As you light the cotton wick, you’ll get to enjoy up to 50 hours of therapeutic healing from the essential oil scent. The fresh fragrance of orange and lemongrass will soothe your worries quickly. You’ll also find this handcrafted candle a piece of art fit for your lovely home. There is no need to worry about toxic pollutants in your house as this candle is made of food-grade waxes. Both adults and children can benefit from the healing effect of this candle. As only natural ingredients made their way to the candle, there are no concerns about allergy effects from using this candle. The smell of citrus is also in the right balance and not overpowering. Lighting this scented candle will be great when you’re spending time relaxing at home. Some people may dislike the scent. Established in 2014 in a garage, Wax and Oils eventually moved to its manufacturing facility shortly. It is committed to creating candles that burn cleanly and does not cause harm to the earth. Every candle produced by Wax and Oils are hand poured and handcrafted to provide the personal attention the candles deserved. This special set of scented candles carried 3 flavors, vanilla, lavender and peppermint eucalyptus. Each will bring different ambiance and therapeutic quality to your home. Made of a natural cotton wick and soy wax, the candles are safe to burn compared to those with paraffin. Each of the candles will last a total of 20 hours. The essential oil blends are created to comply with IRFA regulation and safe for you. These neatly designed scented candles not only made fine decor in your home but also as perfect gifts for your loved ones. While they are packed in smaller sizes than other candles, the strength of the aroma is strong enough for your room. You can place of them in each part of your home or mix your favorite scent to create your personal comfort zone. Nice aroma from essential oil blend. Some find the scent underwhelming. When it comes to scented candles, natural ingredients are just the fundamentals for La Jolie MUSE. What’s more important is the harmony between wellness and the design that turn their products into pieces of arts. As a fast-growing online store, La Jolie MUSE is well known for both quality and timely deliveries. You can stop worrying about gift box if you’re planning to get this scented candle for a friend. It comes with a beautiful signature box with black and gold detailing fits for any occasions. 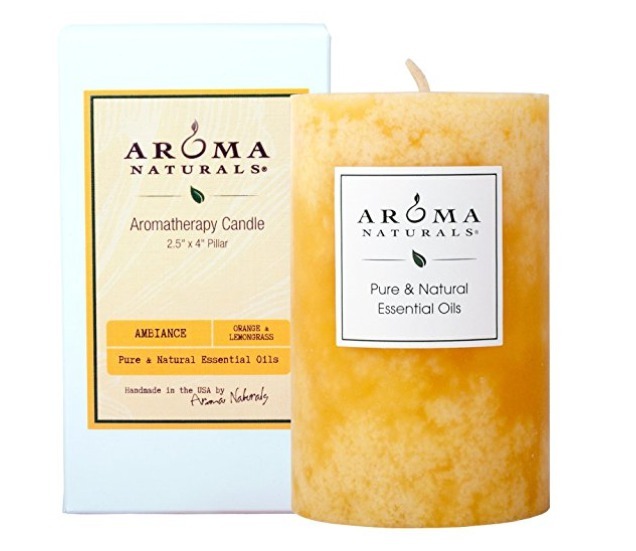 This gift of wellness is made of natural soy wax and cotton lift. The candle carries a jasmine blossom scent that would permeate your room without overpowering it. You’ll have a Hawaii ambiance right in your house. The candle could last up to 60 hours before you need to get a new one. This pretty scented candle and gift box are not cheaply made. They are made with care and scream high quality and gives you the relaxing scent that you sorely need. For ArtNaturals, beauty and nature are inseparable. It hunts down the best natural ingredients from the planet to make high-quality products for physical, mind, and spirit. All these while making the wellness essential products available at an affordable price for its loyal customers. When every room in your home needs a scented candle, this gift set of naturally made candles is perfect for you. You have six scented candles with different flavors to choose from and each will bring a different mood to your home. 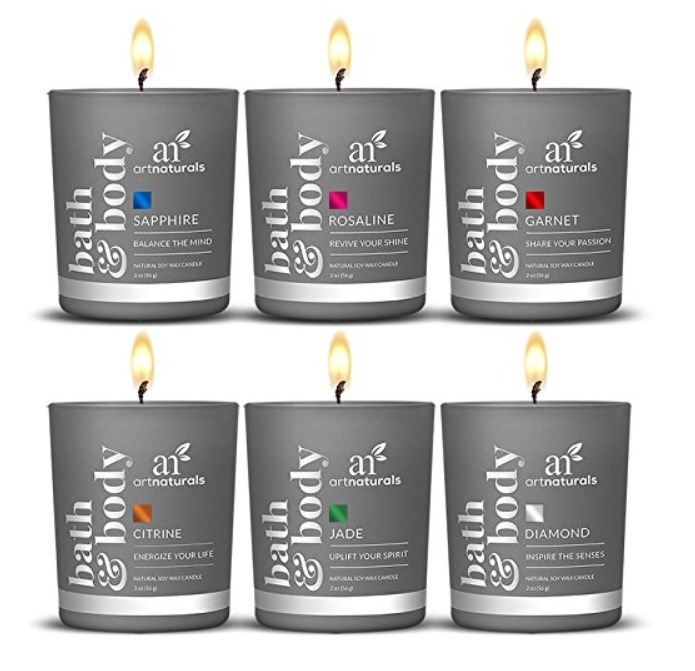 The candles are perfectly safe for human as they are made from natural soy wax and cotton wick. There are no harmful pollutants produced when they are lighted. Each of these candles will last up to 8 hours when lighted up. They are blended with natural essential oils and you’ll enjoy the therapeutic effects of aromatherapy as your room are permeated with the sweet floral scent. These cute looking scented candles also make perfect gifts for your loved ones. Six different natural floral scents. Natural soy wax and cotton wick. Some may find the scent too weak. The story of Bluecorn Naturals started in 1991. Back then, Jon Kornbluh learns the art of making beeswax candle in a house without electricity. 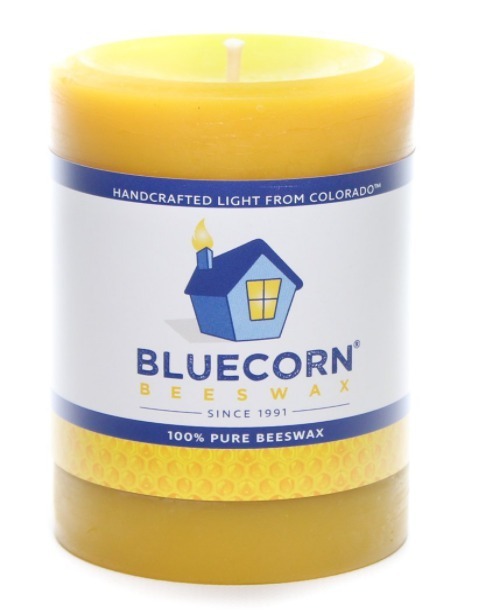 After more than 2 decades, Bluecorn Naturals has grown while still maintaining the fundamental principles of making high-quality beeswax candles. Beeswax is non-toxic and known to emits negative ions that purify the air. This scented candle is made of 100% pure beeswax and does not cause any allergic reactions. You can use this hypoallergenic candle safely in your home. Unlike other beeswax candles, this has little difficulty in burning as the beeswax are lightly filtered to prevent clogging of the cotton wick. You’ll enjoy the lovely sweet scent of honey for up to 60 hours for this 3″ x 4″ pillar candle. If you’re not into fragrance scent, then this beeswax candle is perfect for you. You’ll also find that it is solid and smooth, a sign of a well-made candle. The light will give off a warm glow without any intoxicating smoke. The wick is too short for some candles. The founders of Homesick started their scented candle business in a kitchen experimenting with scents to brings memories of people and places. 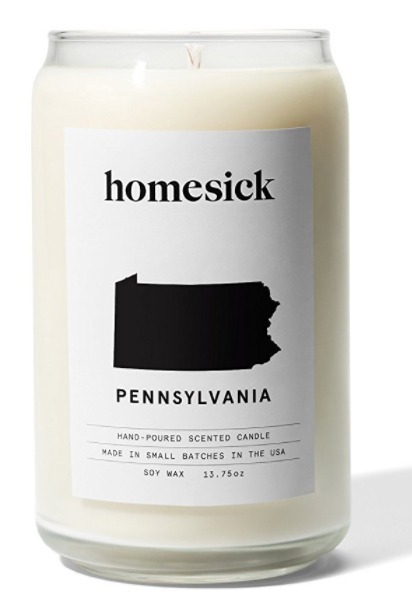 As their friends from various states requested specially made candle for their state, Homesick was born as a business. This scented candle may just cure your homesickness. Made of natural soy wax and cotton wick, the scented candles carries flavors in US states theme. This particular version of Pennsylvania has a rich aroma of maple, caramel, malty molasses and buttery roam complemented with dark cocoa and dry tonka bean. Spotting a modern looking jar, the candle will burn up to 80 hours in your home. That’s more than enough to get rid of typical homesickness. If that doesn’t work, you can try flavors from other states too. The candles are handmade and would make great gifts for your friends in other states. Homesick is all about bringing back nostalgic memories with the power of scents. It comes with an elegant packing box with matching the design of the candle itself. Variety of scents to choose from. For Benevolence Los Angeles, it is more about giving than selling. It makes meaningful gifts that are tied to specific charitable causes. Benevolence LA beliefs in the difference it makes when each little small acts of generosity are brought together. 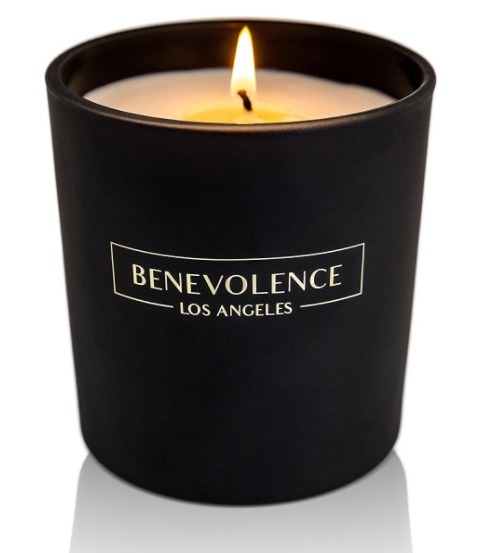 This scented candles by Benevolence LA is made from premium essential oils and fragrances. It carries a blend of floral and citrus scent that is not overpowering. Made from original soy wax, you won’t find any residues from the candle. You’ll find this scented candle great for anxiety relief or simply help you to get a better sleep. Expect at least 45 hours of burn time with this scented candle. This is approximately 3 times as long as other candles of the same size. Besides lighting up your home, you’ll also be making a donation to the cause of preventing child abuse and trafficking. If you’re seeking a scented candle as a gift for your friends, you’ll find the black and gold premium gift box well-matched for any occasions. Made of natural soy wax. Burns for at least 45 hours. A balanced scent of Jasmine and Bergamot. Some find the scent slightly weak. You may have bought yourself a naturally scented candle that doesn’t turn your room into a pollution chamber. But you still need to use scented candle the right way to keep your safety in check. After all, it is lighted up with fire. Here are some helpful tips to use scented candle safely. You need to ensure the wick is not too long. The perfect length of the wick is 1/8 inches. Trim the wick if needed. This will help prevent the flame from getting larger and burning the side of the jar. Make sure the scented candle is burned for more than 4 hours. Do not place the candle near curtain or any materials that are easily flammable. 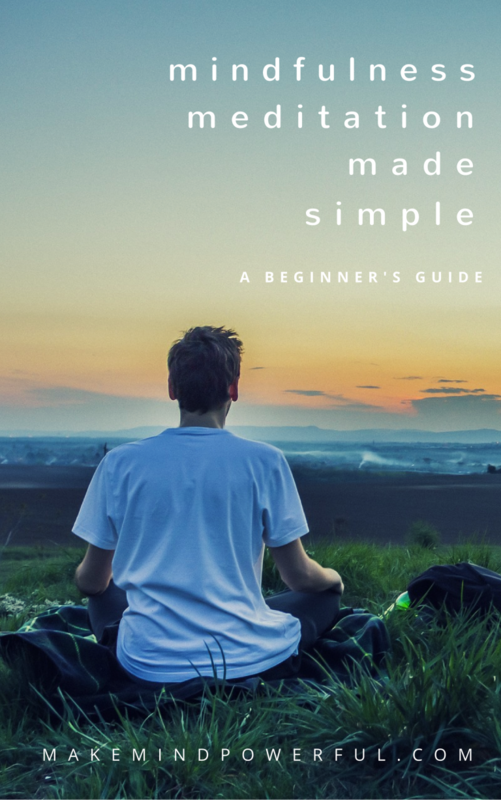 I hope you found the right scented candles for your home from this guide. Do you use scented candles for aromatherapy? What’s your preferred fragrance? Share your thoughts in the comment below.